The following post was written by Anne Ferrari, Owner and Founder of Vita Pulita, the first Herban Lifestyle Store Artist of the Month. During the month of December, Anne’s soaps will be featured at our new brick and mortar store in Fairfax, VA. I was always fascinated by soap. As a child growing up in the Bronx, NY, I didn’t have many soap options, but I was still fascinated with making soap pretty. My holiday gift to my first grade teacher was an ordinary bar of soap on which I pinned a homemade pompom. The obsession with soap remains. It wasn’t until my good friend Mary Kearns shared with me that she had started making soap herself that I was finally inspired to give it a try. And once I did, there was no turning back. As a professor with a PhD in psychology, I am accustomed to using research in my work experience. This serves me well as soap ingredients need a great deal of research too. One customer of mine confessed that she didn’t worry too much about what she put on her skin as she believed that it was not absorbed by her body. Unfortunately, research on breast cancer and the use of parabens in beauty products shows us otherwise. Vita Pulita products never contain parabens, as they never contain artificial fragrances or colors. They are products that I feel confident using and sharing with my family. In fact, Vita Pulita was born of necessity, when my pregnant daughter could not find a safe yet still luxurious body butter. I whipped up a combination of unrefined shea butter, unrefined cocoa butter, rice bran oil, and essential oil. I still sell that body butter, and it is a customer favorite. Although I am not an artist, one of my favorite things about making soap is making it beautiful. Many of us assume that” beauty” and “natural” do not go together and quite frankly, there are some colors that simply cannot be made naturally in soap, such as a vibrant blue. 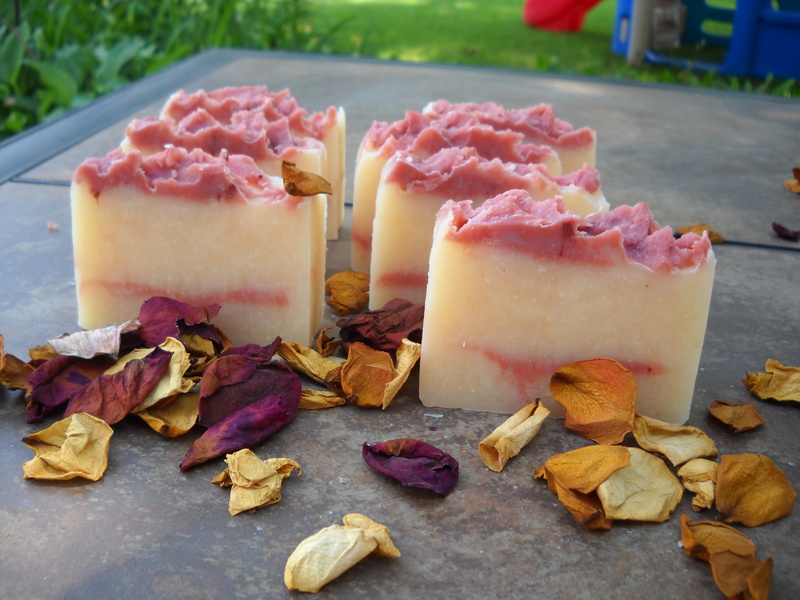 However, natural soap can be just as lovely, especially when one dives into her creative side. 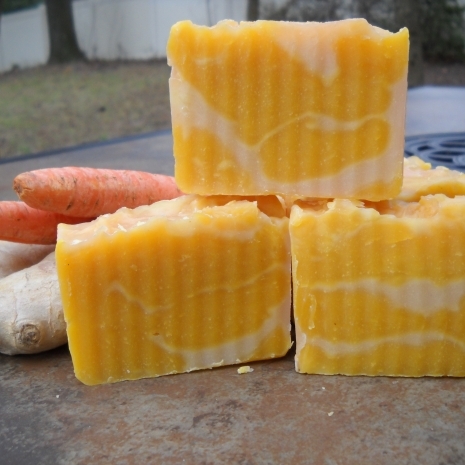 Check out my White Wedding Soap, Carrot Orange Soap with Cocoa, Black Charcoal Facial Detox Soap, Cupcake Soap or Pink Sea Salt Bar and see what you think. All of the colors and scents in Vita Pulita Soaps are from natural and healthy sources, such as plant essential oils and ground up spices. If a color or scent cannot be made using this method, then it will not be made. It wasn’t until recently that my father shared with me that his mother made soap in Italy from olive pomace left over from the farm. I was shocked, but not surprised. I was named for her after all (over the protests of my mother who did not care for the sound of “Anna Maria”), as I was born on the anniversary of her death. And I chose to name my company Vita Pulita, which means “clean life” in Italian, although I don’t speak Italian myself. Perhaps the founder of analytical psychology, Carl Jung, would say that my need to “soap” is part of my family collective unconscious, inherent in me. It certainly feels that way at times. 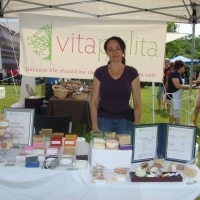 You can find Anne’s products online at the Vita Pulita website, on Etsy and seasonally at markets in Westchester County. In an effort that would make Jamie Oliver proud, last September, the USDA and First Lady Michelle Obama launched the Recipes for Healthy Kids competition. The goal of this program is to encourage the development of creative, nutritious, and kid-approved recipes that schools can easily incorporate into National School Lunch Program menus. Entries were accepted from September through December 2010. From among the 340 entries submitted, five were selected in each of following categories: whole grains, dark green and orange vegetables, and dry beans and peas. These finalists will be visited by a team that includes a USDA official, an American Culinary Federation chef, and a school nutrition professional to narrow it down to the three finalists (one from each category) who will participate in a national cook-off event this summer. You can see the finalists on the Recipes for Health Kids website, check out all the yummy-looking recipes, and vote for your favorite. Voting for the Popular Choice Award closes on May 15. I first learned about Nusta Spa in downtown DC two years ago when I read an article in the Washington Post about the state of spas in the wake of the economic downturn. I found owner Elizabeth Snowdon’s perspective interesting in that she viewed her competitive set as not merely other local spas, but rather the larger luxury market (e.g., vacations and other high ticket items). In viewing it this way, she was optimistic that people who might normally spend thousands of dollars to treat themselves would find a day at her spa a legitimate and enjoyable cost-saving alternative. It turns out that she was correct in her prediction, in that Nusta Spa is still here, and it’s thriving. When I visited on a recent Friday morning for interpretive massage and pumpkin facial, the lounge area was filled with people waiting for their treatments. And in a recent thread on a local listserv, a request for referrals to local spas resulted in 10 recommendations, 5 of which were enthusiastic votes for Nusta. After going way too long without a full day off, I decided to finally use two gift certificates I had purchased through Live Green‘s Greenback program (a socially responsible group buying program featuring only vetted truly green companies). I was pleased upon my arrival to see a decal on the door indicating that Nusta is a Live Green Spot, like Herban Lifestyle! And it’s no surprise that Nusta would be among the vetted truly green businesses in DC. The facilities are housed in a LEED Gold certified commercial interior. On their website, they state that “impact on the environment has been an important factor in every decision we’ve made. From the choice of product lines and packaging to the paper and ink used for printed materials, an all-encompassing approach to eco-friendliness is a top priority at Nusta Spa.” They use LED lighting, Energy Star appliances, furniture and other decor made from recycled materials or renewable resources, like bamboo. And, nearest and dearest to my heart, they are committed to using only natural and organic products. I loved inhaling the scent of the massage oils and facial treatments, which smelled of pure essential oils, not fragrances. Another thing I loved about Nusta was that it feels as if you are at a retreat, rather than just a day spa. There was a peacefulness to the place, and everyone there gave the impression that they had all the time in the world for you. It was so relaxing! Nusta offers a full menu of treatments, including body scrubs, dry brushing, full body detox, sunless tanning, microdermabrasion, skin peel, manicures, pedicures, waxing, threading and electrolysis. They also offer bridal services. So, if you are looking for a retreat in town, I highly recommend that you check out Nusta Spa, located at 1129 20th Street, NW, Washington, DC 20036. My first exposure to the blog world was back in 2003, when I learned about Heath Row’s Media Diet. Heath posted short bits on all types of media, often several times a day from his Sidekick. Through it, I learned about the latest in cool communication gadgets, publications and web-related resources. I found out about Ryze and LinkedIn, two of the earliest players in the Web 2.0 world, which became amazing resources for me. To me, Media Diet was the model for what blogging should be. And it inspired me. I started my first blog on Blogger in early 2004. However, because of intense demands on my time, and a feeling that my posts had to be profound and exquisitely written, I found myself posting sporadically, and eventually closed down my blog. My feeling at the time was that if I didn’t do it extremely well, there was no point in doing it at all. The perfectionist part of me convinced me to stop doing something I enjoyed because I wasn’t doing it up to my own really high standards. Last year, my interest in blog writing was reignited and Becoming Your StellarSelf was born, a reincarnation of my initial blog’s focus. I approached it with the attitude that I would write about topics that really interest me, whenever I was inspired, whenever I had the time. As a result, I’ve greatly enjoyed the process, and have found my blog to be a great creative outlet. The other day, I came across a blog whose first entry was back in 2004, followed by a few in 2005, followed by a steady stream of entries from 2006 onward. I thought back to my first blog and felt rather wistful — I didn’t have to shut it down, I could have been happy writing when I had the time and inspiration, I could have accepted something less than perfection, and it would have been fine. Then I remembered that, this time around, I am doing exactly that. I recently had the pleasure of interviewing Karen Lee, Co-Team Leader of the EcoEtsy Street Team (a group of Etsy crafters who are dedicated to earth-friendly practices), and owner of EcoKaren, a company offering eco-friendly, green, and reusable products for you and your home. Karen also writes a very thoughtful and timely blog on the green living, including environmental issues and eco-friendly products. Please tell me about your company! What do you make? What types of materials do you use? And what is your focus/mission? Ecokaren carries one-of-a-kind, handmade, eco-friendly items. No two items are exactly alike as I only use materials (resources) I already have. When I do buy any new supplies, I buy sustainable materials like organic fabric and yarn. I also use freecycle and thrift stores to repurpose items that people want to throw out. My latest project is handmade journals that incorporate leftover paper from my kids’ end-of-the-year notebooks. The journals are handmade using coptic stitching and Japanese binding methods. My mission is to use existing resources for functional and practical eco-creations instead of buying new materials. If I look around, I can always find things to make with them. So, my shop’s focus may not be “home decor” or “jewelry” or “fashion” but it’s whatever I find that’s available that I can make something with, at that moment. I have fun being spontaneous and coming up with things to make by looking at a heap of fabric scrap and notions. 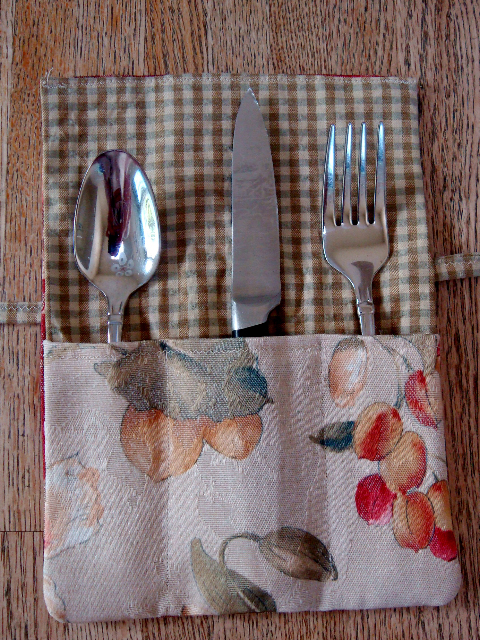 And to take it one step further, I try to make items that will help reduce waste, contribute to being green, and also save money… like reusable utensil holders that allow you to carry your own utensils instead of using disposable plastic ones. It cuts down on plastic usage, reduces waste and saves money since you don’t have to throw away utensils! I am a “retired” chiropractor. I sold my practice to support my family full time. So, while waiting on the sidelines for my two active teenagers to finish their after school activities, I picked up knitting and crocheting again, after stopping for fifteen years. I gave away numerous finished goodies as Christmas and birthday gifts to family and friends and they suggested that I sell them. That’s when I found Etsy. 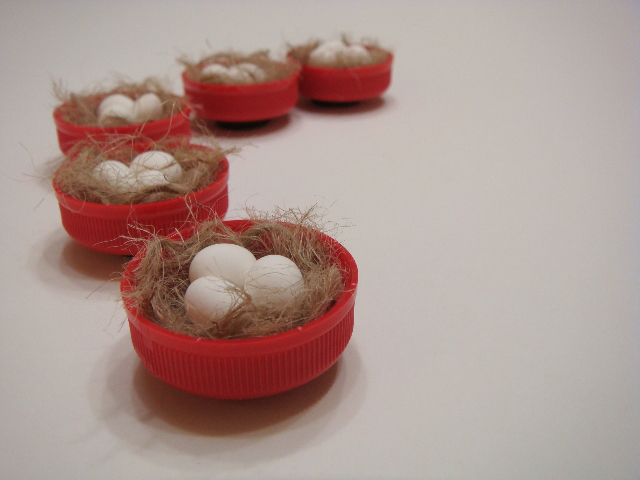 I sold my organic knitted washcloths and repurposed plastic bottle cap birds nest magnets when I first opened my first shop, ‘ecogeneration’. So you are a chiropractor! How has this background influenced your choices as a green mom/blogger and eco-crafter? Chiropractic philosophy is very much in line with taking care of the planet – our mother Earth. The chiropractic tenet is based on the belief that power that made the body heals the body. If we screw up our body, only the body can heal itself. We can use external interventions to help the process sometimes but in the end, the body has to do the healing. The life force in our body has the power to heal itself. Well, I believe the earth is like the human body. Given a chance, the Earth has its own life force to heal itself too. However, we are constantly abusing the Earth that we are making it impossible to do that on its own. So, like the way our body needs external interventions, the Earth needs us to help it heal. I want it to have the best possible chances for it to do its magic and get better. Being a chiropractor, I see myself as a healer, or as a helper in its healing process, and not the destruction process. Becoming a green mom, a blogger, and eco-crafter all stem from the same philosophy. I don’t consider myself an environmentalist by any means. But practically speaking, I have been living an environmentally responsible life because of my mother. She lived a very frugal life as an immigrant and she taught me how to save and reuse. She was being green even before it was a trend. So I learned from her how not to waste our valuable resources. In addition, as a Chiropractic Doctor (doctor means ‘to teach’ in Latin), I used to teach my patients on how to stay healthy. Actually, I used to talk about many of the issues I currently write about on my blog. I used to relate nutrition, industrial chemicals, farming practices, pesticides and herbicide to health. Environmental issues weren’t really labeled as such, but I was addressing them when I spoke to my patients about how their environment affects them. Now, I carry the same torch when I blog about these issues. Spreading the word and ‘teaching’ my readers on how to be green is my way of helping to heal the planet. As co-leader of the EcoEtsy Team and an eco-crafter, what is your advice for new (and experienced) crafters who want to make their businesses more eco-friendly? When I joined EcoEtsy team as a new seller on Etsy, I was so inspired by the members’ creativity and their passion on being eco-friendly. I learned so much from reading the team’s blog, forum discussions, and team events. I was humbled by so many great sellers who cared about their eco-friendly crafts, business practices and educating others how to be green. So when the opportunity came along to become a co-leader, I took the challenge. I knew I couldn’t do it alone but I also knew that the members will be very supportive so I dove in head first. And guess what? I was right. The team is full of energetic, smart, and earth-caring members. We have a new blog, we had our first Earth Day Auction and raised over $450 (after expenses) to donate to the World Wildlife Fund, and I am planning our Fall event (already!). Being a member of EcoEtsy (and becoming a co-leader to give back to the team) was the smartest decision I ever made. And that is best advice I can give crafters who want to be eco-friendly – surround yourself with others who have the same mission. You need the support of others who think like you. You need to ask questions on what is more green, bamboo or organic, paper or plastic, reuse or buy new, etc. There are so many resources available on being green now that it’s almost impossible NOT to be green. And what’s better. It saves you money!! Imagine, never having to buy shipping supplies and being green at the same time! One easy practical tip I want to share is to utilize your computer to the maximum. I save everything as pdf files and don’t keep any paper copy (saves paper). Do online banking and forget about paper statement (safer for identity theft too). Use e-mails and save them in a separate folder on your hard drive. Use internet shipping service and have the mailman pick up your goods to be shipped (no need to drive to the post office). There are so many things you can do online now that you don’t need to keep any physical files or papers or statements. Once you realize the financial benefit of being eco-friendly, you’ll never go back to your old habits. Pretty soon, you will find yourself making the same changes at home too. We recently celebrated the 40th Anniversary of Earth Day. What are your plans (both professional and personal) for the 50th Anniversary? Professionally, I hope to continue to be blogging and sharing eco living tips, but also shouting about the discovery of smart alternative energy that does not involve destroying the environment. I hope we will be celebrating the discovery renewable and sustainable energy sources. I hope we won’t ever have to deal with the disaster that is going on in the Gulf again. I hope I’ll be blogging about that happy news. Personally, I hope to be living off the land and getting off the grid. My hubby is not a farmer, but he’s so fed up with the current state of the environment that he’s willing and ready to learn to be one. We talk about moving up state NY and buying some land and not worrying about where our food is coming from or relying on unreliable utility companies for energy (we had two black outs this past winter). As I get older, I yearn for a simpler life. And in ten years, who knows? Maybe I will be able to. Thank you, Karen! You can find Karen on Twitter, Facebook and Etsy. 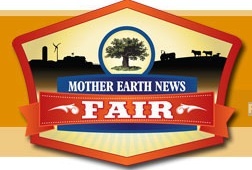 And I highly recommend you check out the EcoKaren blog. In the past couple of weeks, two different friends told me they are planning trips to Rome (lucky them!). Because I visited Rome two years ago, they had asked me to suggestion some interesting, non-touristy places to visit. 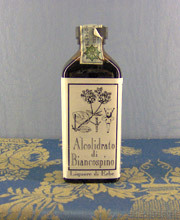 One of my absolute favorites was an apothecary that carries only products made by monks. Many of the herbal products are made using centuries-old recipes. 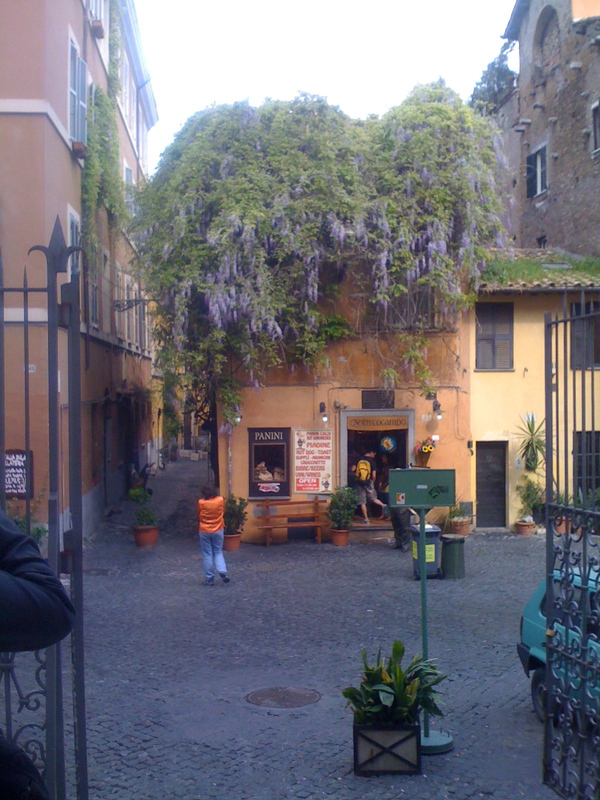 As I mentioned in a previous post, one of the things that has struck me about Rome is the interweaving of the sacred and the profane in every part of the city. An example of this was my discovery of an incredibly unique and wonderful store called Ai Monasteri, which features products made in the ancient monastic tradition. This beautiful store, set up like an old pharmacy, carries a variety of handcrafted essential oils, wines, liquors, preserves, honeys, beauty products, candies and teas produced by monks from 7 different monasteries throughout Rome. In addition to these more typical souvenir-type products, they also carry a variety of elixirs and remedies, made from ancient recipes. When the store was established in 1894, herbal remedies were their focus. 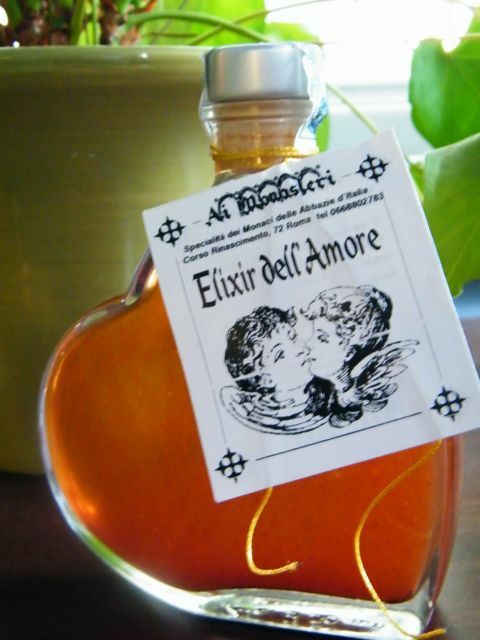 And many of the products are made from recipes dating back to pre-Christian Rome, which were preserved through the writings of the monks during the Middle Ages. There are remedies for all that ails you, including stress, joint pain, weight control, melancholy, sleep disorders, fatigue, eyesight, cholesterol, circulation, digestion, skin health, coughing, smoking cessation and much more. If you are interested in Ai Monestari’s products, they can be ordered through their website. Their PDF catalog contains detailed descriptions of their many wonderful products.